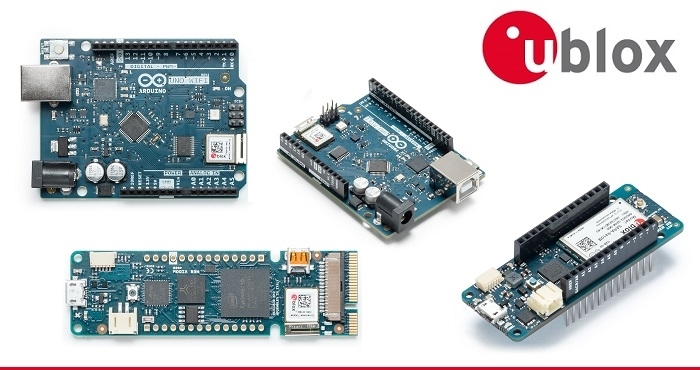 u-blox along with leading open-source hardware and software ecosystem provider, Arduino, has introduced four new boards to their MKR family, delivering enhanced wireless connectivity options for IoT applications. Previously Arduino adopted u-blox for their MKR GSM 1400, now one of the most popular boards of the MKR family for its unique characteristics and robustness. One of the boards released is the MKR WIFI 1010, a Cortex M0-based board that provides Wi-Fi connectivity to IoT projects. With a highly optimized design it integrates the globally certified u-blox NINAW102 stand-alone multi-radio module delivering WiFi and Bluetooth connectivity. Featuring an open CPU, the NINAW102 allows Arduino to run their own application right on the module, offloading communication tasks from the user-programmable Arduino CPU and increasing the board’s power efficiency. Two more new boards incorporate the u-blox NINA-W102. The MKR Vidor 4000 is the first-ever Arduino board featuring an FPGA (field-programmable gate array) chip coupled with an innovative development environment, which aims to democratize and radically simplify access to the world of FPGAs. The Uno WiFi Rev 2 aims at making it even easier to deploy products that need Wi-Fi connectivity. In addition Arduino expanded its cellular offering with the MKR NB 1500, which hosts a u-blox SARAR410M cellular module providing LTE Cat NB1 and LTE-M cellular connectivity that is pre-certified for global use. Also equipped with an ARM Cortex M0 microcontroller, the MKR NB 1500 is fully geared towards IoT applications with low demands for bandwidth and data volumes and is optimized for ultra-low power consumption, enabling highly efficient battery-powered applications.